The information in this article is provided by PIO Jason Evans, from Dallas Fire Rescue which was distributed to affiliate news channels early in August. Thank you so much Jason and for all you do for the City Of Dallas. We want to tell you about something that took place over the past weekend that absolutely blew us away and why we have access to this information about Dallas Fire Rescue. I always have tears when I see First Responders running into a fires, situations where shots are fired, emergency rooms & operating rooms, and all dangererous situations of any kind ...There is something so mystical and illuminating about a scenario like that. I am in awe of those who live their whole lives for others so we can have a better life, safety, and a better place to live. So I have to share this with all of you clients and friends in the iComEx Community. Saturday my phone pinged me about a Facebook post from a family member onto my social media page. It was from my neice in Tyler, Tx. Low and behold I see a photograph of Dallas Fire Rescue Firefighters in an airport setting. Beautiful i thought, the picture and to my niece, an educator, a big thank you as she knows how we feel about First Responders. It was so sweet to send this to us. I was so overpowered at the site of these firefighters I just started crying. The impact of seeing it filled my heart with love and gratitude that I was beyond words right then really. As I prayed for all of them I thought people need to be reminded of the good deeds done by others on their behalf. So...I decided to post this article for our iComEx family community. I realized in the post for me about the picture that these were first responders landing in California to help fight the still burning fires happening in the state. 97 Texas firefighters, representing 32 local fire departments, were deployed to Northern California to help with the wildfires. Those individuals will be staffing 31 pieces of heavy equipment, including 25 Engines, while on assignment. 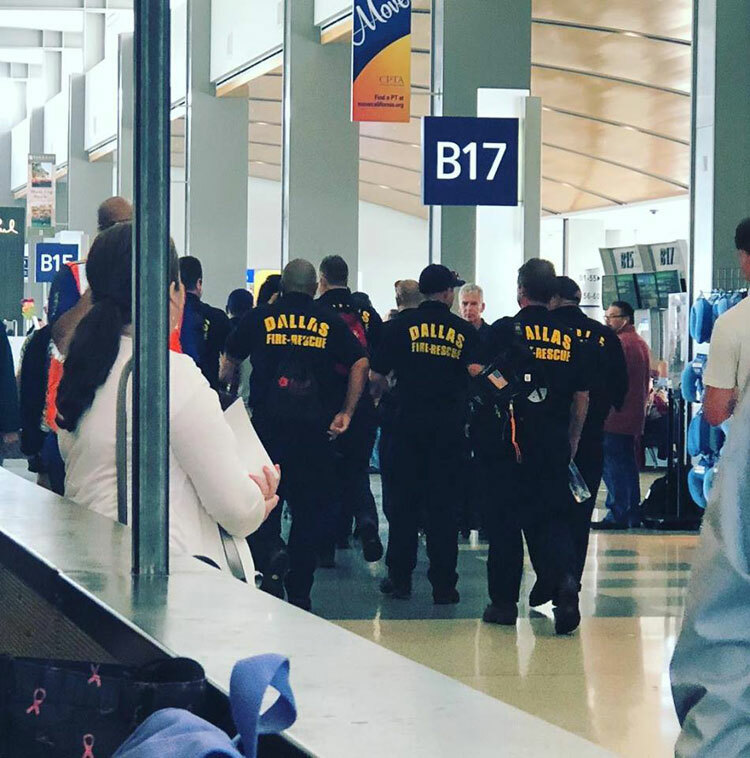 Anese Cavanaugh, an educator and the person who sent my niece the photo, indicated that while she was waiting on her flight; she looked up and saw the site of some 97 firefighters walking beside her she too became overwhelmed and took out her camera and snapped the picture. Dallas Fire Rescue firefighters shirts are visable as they passed as you can see. Let it be shouted to the heavens how much we love and care out these First Responders and them putting their lives on the line for everyone in California effected by the ongoing fires. To Dallas Fire Rescue, the fire departments in Frisco, Lewisville and Little Elm as well as all who went to California from all over the State of Texas. We have you in our hearts, prayers, and thoughts everyday until all the fires are out. And beyond as you move through each day you are there for all of us. When: Tuesday, August 7, 2018, at 11:00 a.m. Details: The State of California requested assistance from the State of Texas through the Emergency Management Assistance Compact (EMAC) to aid in battling their wildfire outbreak in Carr. In response, the North Texas Branch of the Texas Department of Emergency Management, through the Texas Intrastate Fire Mutual Aid System (TIFMAS), is coordinating the deployment of a Strike Team, consisting of personnel and equipment from multiple area departments, to assist with the efforts. As part of the team, which includes fire departments from Frisco, Lewisville and Little Elm, Dallas Fire-Rescue (DFR) will be sending two (2) Type III Brush Trucks, one (1) tactical tender and 11 firefighters to the area just north of Sacramento. Though there is no defined time for which assistance will be needed, the initial strike team is prepared to be in place for no longer than a 14-day deployment period. If resources are required beyond the initial response, a new team will be sent in relief, until assistance is on longer needed. According to California Fire officials, the Carr fire began on Monday, July 23rd, after a tractor trailer tire blew, causing sparks from the rim to ignite the blaze. Since then, the fire has grown to consume a significant square mileage of land, destroy over 1,700 overall structures, to include almost 1,200 homes, and claim the lives of 6 people, including 2 firefighters. As of Monday, August 6th, the fire was reported to be only 43% contained. “It’s for situations like this that these processes are put in place,” stated DFR Fire Chief, David Coatney, while talking about the deployment. “Local Mutual Aid agreements can be a nice convenience; but programs like EMAC are critical when our help is needed outside of State lines”, he added. Overall Deployment: As part of this State-wide emergency management request, 97 Texas firefighters, representing 32 local fire departments, will deploy to Northern California to help with the wildfires. Those individuals will be staffing 31 pieces of heavy equipment, including 25 Engines, while on assignment. About EMAC: Formed in 1993, the Emergency Management Assistance Compact (EMAC) is the nation’s mutual aid system. EMAC enables states to share resources during natural and man-made disasters, including terrorism. 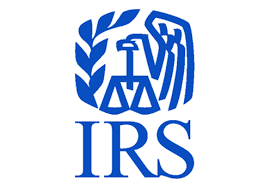 Under EMAC, requests and deployment of resources are made at the discretion of the affected state. About TIFMAS: The Texas Intrastate Fire Mutual Aid System (TIFMAS) was established by the Texas Legislature, is maintained by the Texas A&M Forest Service and provides all-hazard response, with over 5,000 local firefighters. TIFMAS is supported by cities, counties and special purpose districts across the State. They have responded to every major disaster since 2008, and have deployed 51 strike teams to Texas wildfires in 2018. Thanks again to Jason Evans at DFR for your kindness in providing this Press Release, and to Anese for sending the picture to me via my niece. It is very comforting that First Responders provide so much to all of us just by living their lives and doing their jobs. Well Done! Do you know your customers and have a great relationship with them? Simple question, but hard to make a reality right! Pay close attention and start this year out equipped with some simple but very important concepts that will make a difference. iComEx is here to serve you. Leveraging technology is our goal for you. Whether it's high tech or low tech, it's about you and your needs this year. Many sound business tactics insure your customers are well taken care of. Phone calls, emails, newsletters, polls, special offers, new services, customer loyalty offers, referrals programs, and more are just a few of the many ways the business community at large insures every customer has their needs met. If you are not providing this type of service currently, you may be missing out. 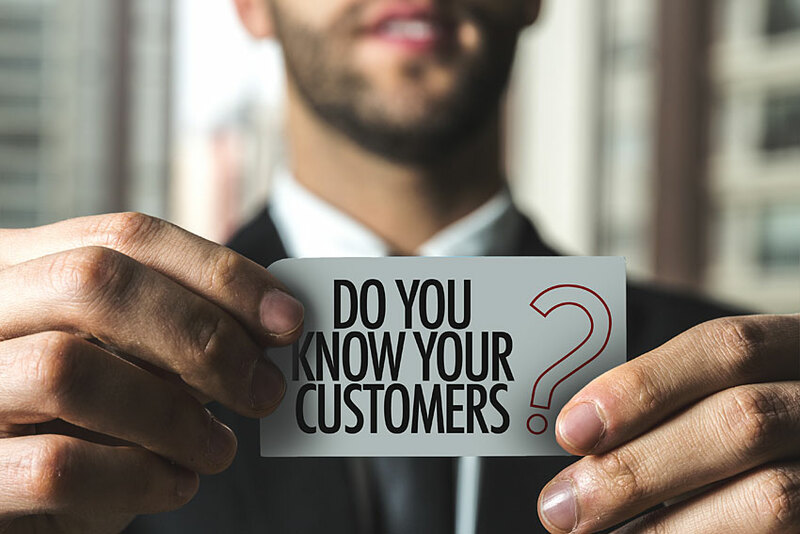 Below are 15 ways to make sure your customers know how valuable they are to you and your business. A planned positive impact is how we maintain your business, and ours in turn. In addition, we also believe that if you are a happy positive client, you are much more inclined to recommend your business to others through word of mouth and online reviews. That is always a great asset. Customer retention and making sure we are educated about your industry may be difficult at times, and we may not always be on the leading edge but we try our best. How? We hope to understand how to apply what we learn from your customer reviews so we can begin to turn it into customer retention on our part. It all starts with taking customer relations seriously. And that means that we contact you as much as we can every day of the year. The first and most important is Remember This List - Unless you do something each month or every time you have contact with your clients it will do no good. Having a planned strategy every month is the beginning of developing the kind of relationship that means something for all parties concerned. If you have a marketing person who is in charge of this, then you need to meet personally with that person, get involved in January and work out a way to meet, educate, greet, follow up, and then continue with a plan as often as you can. Setting goals which include you personally goes a long way with your clients. Taking the time to make sure they know you personally appreciate their business is a must. Customer Touch Points All Year Long - Don't make it about one month or even a quarter. They like you run your business year round, and put in place best accepted business practices that will benefit your business and revenue models as you learn about them. It's really all about you. We hear you, plan, execute and then thank you for your business. We need to be in contact with your or your delegated representative - Small courtesies can go a long way. A friendly greeting, and if you come to our facility we must make sure someone is with you to answer any questions you may have. If a retail location is available we do recommend a top sales person on our front to make that happen. A great first impression can provide you peace of mind about each experience you have with our company. It is common for us to ask you for feedback or even your input and opinion. New products, campaigns, recommendations from you are all attempts to provide to you what will be considered a success. If you provide input at the decision making process, we have made it successful from the start. So, be sure to let us know if we forget something as well. Remember social media postings on a regular basis, newsletters, and a thank you go a long way toward better customer relations. We encourage participation and leveraging technology on your behalf will benefit both of us. Point of sale contact for benefits everyone, and polling for more information each time we see you is our best bet at keeping ourselves educated about your special needs for your industry at large. What type of experience do you have when making purchases with us? By creating an experience with you by having meetings, classes, projects, or DIY projects are a few ways to organize creativity for you and for our business in meeting your needs as our client. Keeping our sales department aware of your specific needs mean we understand what matters to you as well as what will be required in order for meeting that need. As consumers continue to value experiences over things, giving them a unique activity will demonstrate you understand what matters to them. Connect with your audience as often and in as many ways as you can. Social Media is hot right now. Customer Appreciation recognition is easy and very cost effective when you set up a schedule to connect with your main audience. Asking your customers for photos, videos, MP3's and even new brochures they print means that customers to share their photos and videos involving your services or products with a unique hashtag relating to your business. A repost of their content, giving them credit in the caption is another way to help leverage the best of the best information around. Be sure to keep your contacts engaged - New and diverse content, and that you encourage customers to spread the word about your business by sharing photos or videos with their social networks. Remember to reward customer loyalty at every turn - If they refer clients to you, send them a gift card to a favorite restaurant or business as an example. Whatever you do, keep it simple. Most business owners belong to more than one program, less is more in this case. Easy to participate, easy to understand, and track participation for thank you notes for new clients they bring. Be sure to encourage referrals, which are different than simply loyalty clients. Rewards for friends and family's that do refer new potential clients to you can participate in things that are considered low tech like coupons on newsletters, retention offer's, bonus items for new contracts are just a few options. Discover Your Clients Seasonal Trends - Business is seasonal for everyone. Learn who your customers are means knowing their peak seasons and planning customer touch points around those seasons. Chilled wine, special cocktails at get together' s, and even a cup of coffee on a cold morning for a quick meeting are possible. Make your customers dollars they spend with you go as far as they can - Your best clients need to be expressing a positive attitude about doing business with you. Paying for a product, meal or service is critical in daily activity and is a great cause of interest. If you are giving back to the community perhaps it could be directed to something your client told you about or that they think is important. Step Up at the right time - Please remember that the normal business cycle has ups and downs. If low points are reached in your clients communities maybe you can help by stepping in to support them in a particular manner; you have gained an ally. Lending a hand for local relief efforts may spur them to see you in a different light and offer a symbol of hope to something you believe is important to their industry or community where they do business. Flexible should be your middle name in business - The second point of contact, needs to be as positive as the first has been. Keeping your eye on the ball for your company and for your clients both is critical to success for both parties involved. Make sure return issues are resolved to their satisfaction, and be sure to replace the return with the right product that is functioning properly. Now that you are reminded about so many practical ways to work with your customers, remember that simply put, building customer relationships often means being aware of their feelings and specific needs. Needs meeting needs, is and always has been an easy way to differentiate you from the pack. Never forget your clients keep your business running. Small or large makes no difference; it's about long term satisfaction. If you have 100 clients, and have been in business 20 years, how many of those 100 have been your client the whole time? Make that your goal for this new year. Keeping a solid core base of clients that will never be able to find the type of customer service they have with you anywhere else. Seriously, who can compete with that? In today's world it is all about identifying needs, education yourself and your client, and understanding the economic benefits of meeting those needs all year long. They know your support matters and respect your business ethic and practices. It doesn't get any better than this. Applying proven, results techniques and industry best practices to every engagement, iComEx has been helping clients achieve success by attracting targeted traffic, delivering compelling content and converting visitors into prospects since 1999. Disruptive technology can be used to leverage an advantage to you and your clients. Make it reality in your business today. Call iComEx today and work out a long term plan to secure better business strategy actions for your company. 972-712-2100 Serving North Texas, Dallas, Frisco, Plano Richardson and Texas since 1999. Today everyone who operates needs to make sure they are doing all they can to protect every computer, phone, laptop, and device as best they can. With so much information out there let's talk about where you can go, and what you can do to make that happen in your home, business, or organization. 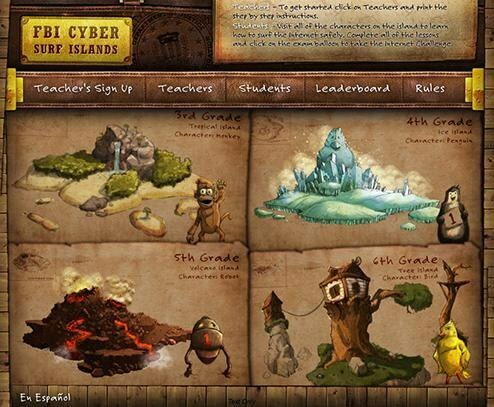 FBI-SOS is a free, fun, and informative program that promotes cyber citizenship by educating students in third to eighth grades on the essentials of online security. Safe Online Surfing - The FBI Safe Online Surfing (FBI-SOS) program is a nationwide initiative designed to educate children in grades 3 to 8 about the dangers they face on the Internet and to help prevent crimes against children. For more information, visit the Safe Online Surfing website. https://sos.fbi.gov/ Thanks to the FBI website for the content contained in this article.